Although considered a remake of The Shaolin Temple – Jet Li’s highly successful 1982 film debut – the connection is more aesthetic than literal. Both films deal with the temple’s ransacking by violent overlords albeit a few hundred years apart. The original film’s Tang Dynasty setting is substituted here for the opportunistic, tumultuous years of China’s burgeoning republic, where power-hungry warlords battle for governmental influence at the cruel expense of the people. Like the 1982 film, this is also state-funded and with the full backing and consent of the existing Shaolin Temple, which in recent years has become a crucial commercial brand for one of the world’s largest economies. And unlike the original film, the temple used here is a mock up. Like most filmmakers who have dealt with the Shaolin subject (and there are many, from Chang Cheh to Lau Kar-leung), Benny Chan’s temple is a familiarly compassionate, apolitical and nurturing place of spiritual and physical learning, which inevitably acts to make the temple’s destruction – including the laboured massacring of its students – even more poignant. Although seen as a refuge from the secular world, the pupils here are not immune to meddling in state affairs, with hot headed young monks seen stealing rice from governmental compounds to give to the poor. Their superior martial arts skills are used only when challenged, but their antiquated ways are out of step with modern warfare: when confrontation occurs, the monks’ sticks are met with bullets and cannon fire. Although the temple may be the film’s centrepiece, it wisely refrains from the sort of behind-the-scenes training montage clichés that were so heavily utilised in the Shaolin films of the 1970s and 80s, and instead centres on the atonement of General Hou (Andy Lau), who is introduced as a marauding, remorseless imperialist acquiring land and wealth through violence, as he guns down a rival warlord pleading for mercy at the steps of Shaolin. Before General Hou leaves, he sends an insult to the monks by scrawling on the temple placard. 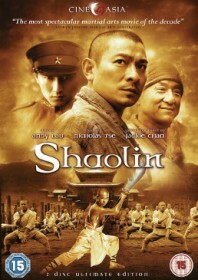 But during an ambush in which General Hou plans to kill and overthrow his sworn brother, the message is leaked by Hou’s trusted, creepy associate Cao Man (Nicholas Tse), who sees Hou’s reluctance to carve up their Chinese empire to help broker a deal with foreign arms dealers as a sure sign of dictatorial weakness and instead Cao Man plans his own usurpation. Following the coup and at the end of a gripping chase, Hou and his wife end up seeking refuge at Shaolin where his young daughter eventually dies. Repenting for his previous sins, the General begins a routine path towards spiritual enlightenment by mucking in at the temple, ritualistically shaving his head, helping feed the refugees who have escaped the greed of successive land-grabbing governments and also learning a bit of kung fu in the process. The rehabilitation scenes are characterised by the presence of long-time Benny Chan collaborator Jackie Chan, who plays a Shaolin chef mostly for comedic effect without managing to detach too far from the central drama. Although the film certainly changes gear with the presence of Jackie, Benny Chan does well to not completely alter the tone of the film, and apart from a slightly extraneous if excellent sequence involving Chan kneading his adversaries like dough on a chopping board, his whimsical presence serves as a mostly welcome relief. But then nothing can really detract from the film’s two huge selling points: a brilliantly commandeering central performance from Andy Lau – surely one of Asia’s best actors – who still cuts a lean figure despite approaching his fifth decade, and is equally convincing as both a military menace and a martial monk. While Corey Yuen’s fight choreography is edge-of-the-seat stuff, aided by a top director who uses his high budget perfectly in creating great action scenes of genuine tension and drama. Yes, perhaps it is a bit too long, and it is not always easy to overlook the film’s propagandist agenda, but this is still one of New China’s most exciting action movies for a long time.